Conventionally, the literature on project management presents the story from the project client, or Owner’s, perspective. Project Management for Supplier Organizations turns this on its head and explores the challenges and remedies from the perspective of the vendors providing the necessary goods and services to a project. It explains the likely impact on the structure, culture, and procedures of Suppliers and identifies the additional competences they may require. It offers new insights, frameworks and models, in particular a new Supplier Organization’s Project Lifecycle Model, that integrate the role of the Supplier as a member of the Owner’s project team with their own necessary commercial activities such as marketing and selling. For Suppliers, this unlocks the contents of the various Bodies of Knowledge, by showing how and where the tools and techniques of project management apply to their particular role. 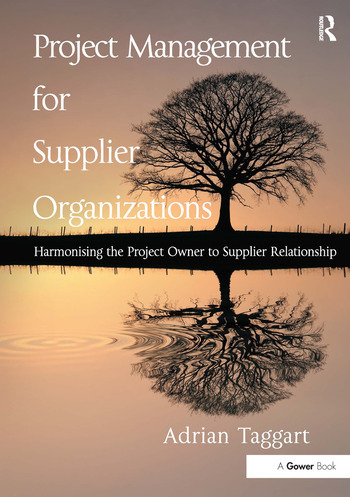 The text explores in some detail the shared and divergent interests of Suppliers and Owners and shows how a well thought-out and carefully executed procurement process maximises the former and diminishes the latter. Such an insight is equally valuable for any Owner Organization. Adrian Taggart’s book provides a refreshing and essential perspective. For Suppliers managing their role in a project, it offers a real insight and an urgent set of priorities. For Owners it shows how best they can work with their suppliers to mutual benefit. Adrian Taggart is an experienced project management consultant. He has managed, and advised on, national and international projects within sectors that include defence, manufacturing, heavy engineering and utilities, requiring him to represent the interests of both clients and contractors. Interest in the topic and its practitioners has led him to teaching project management at MSc degree level, and also tutoring numerous candidates for the professional qualifications of the APM and PMIÂ®. This combination of experience and a detailed knowledge of the Bodies of Knowledge, has given him a strong appreciation of the distinctive differences in how each type of company (Owner and Supplier Organizations) sees project management, the techniques and strategies that work for each, and the different understanding and skills required by practitioners within each.